Inspired by the Indiana Jones movies, Lost River Delta puts you in a remote region somewhere in the jungles of South America. 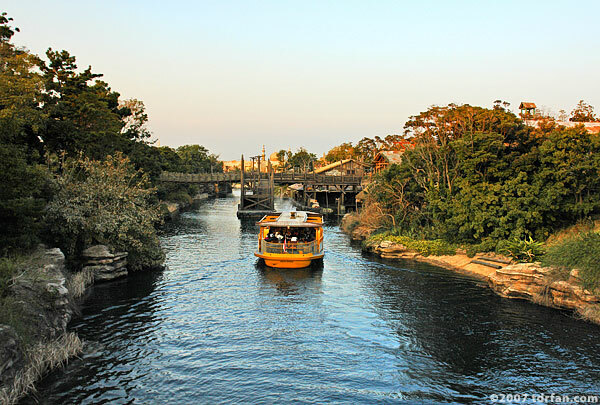 The atmosphere is lush and untamed, and the area is skillfully integrated with the waterway that winds through DisneySea. Much of the architecture of the Lost River Delta creates the feeling of being isolated in a rugged, remote outpost. The buildings look old and weathered, and names like Yucatan Base Camp and Lost River Outfitters help reinforce the air of adventure. The biggest influence on this area of DisneySea and its most prominent feature is the Indiana Jones Adventure attraction. Indeed, it looks like the Lost River Delta area was created for the sole purpose of providing a stage for that attraction. The Indiana Jones Adventure's towering Aztec pyramid is visible from just about anywhere in the Lost River Delta, and acts as sort of a beacon to help you find your way to the heart of this area.